A/O Sandpaper Triangle, 180 Grit H&L 6 Hole, 10 pk. Grizzly T27656 - A/O Sandpaper Triangle, 180 Grit H&L 6 Hole, 10 pk. Buy 5 or More Multi-Tool Accessory Items and Get 20% OffTriangle 6 Hole Hook and Loop Sandpaper fits most triangle detail sanders. 180 Grit, Includes 10 per pack. 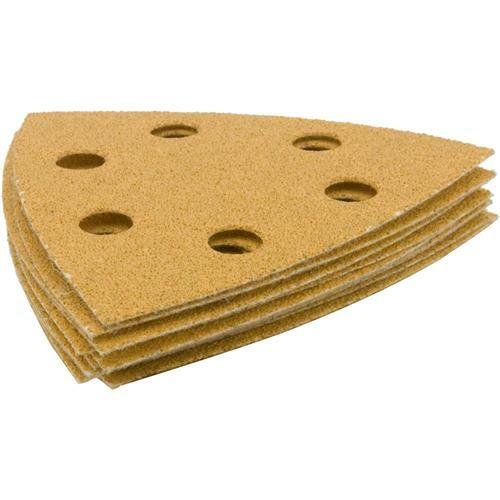 Triangle 6 Hole Hook and Loop Sandpaper fits most triangle detail sanders. 180 Grit, Includes 10 per pack.